Virtual battlefield is not a shuffle! Only the strongest, the clever, and the fast learners are here. A warrior is one who copes well in all situations, works well with his allies, stays calm even under severe fire, and is able to direct his anger only to the enemy. Fury was created to give players the tools they need to survive on the virtual battlefield. Thanks to the well-designed peripherals, the player will become even faster, more accurate, stronger and, most importantly, deadly effective. Each of our solutions, starting with a mouse pad, mouse and keyboard, and ending with headphones, has been created to make their user a true warrior player with a variety of features needed to improve in the virtual gameplay. The names of our products reflect their character and refer to both types of warriors encountered in the modern battlefield as well as to the legendary types of weapons that have provided their holders with some historic victory. 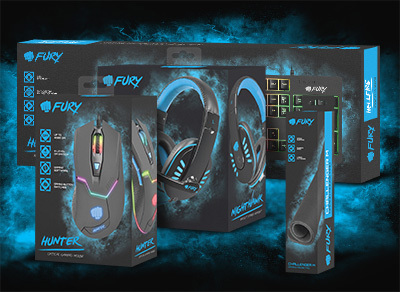 In Fury we want to provide every player with a range of essential features that make it easy for gamers to play their games in a virtual environment.